The future of the U.S. Air Force special operations stomps into the room on the double-in the form of a half-dozen men and women, fresh out of Basic Training, clad in identical off-white t-shirts and blue shorts. At Lackland Air Force Base in San Antonio, no trainee walks. Ever. This facility is about sustained maximum effort. The trainees want to be among the Air Force's elite Special Operations troops, those who leap from airplanes on rescue missions or embed with front line troops to direct airstrikes. But before they can do that, they must face a gauntlet of unforgiving qualification courses. The wash out rates among the Air Force special operations training is infamously high -a recent RAND report from late 2018 found that the attrition rate during the initial Special Forces Assessment and Selection course hovers at 70 percent. The Air Force's solution aims the most cutting edge sports technology at young airmen during an Special Warfare Preparatory Course here at Lackland. Over eight weeks, the 350th Special Warfare Training Squadron will use big data, video analysis, wearable sensors and extreme exercise to teach these young airmen how to optimize their bodies like machines. It's not just their bodies. Instructors here say the airmen's minds also need calibration. One of the RAND report's key takeaways was that the airmen do not understand the challenge they face, and prepare for the minimum standards instead of planning to go far beyond them. "They have to switch gears if they want to prepare themselves for what they're getting into," says Master Sergeant Dean Criswell, a decorated pararescueman with the 350th. Kayden, a 23-year-old firefighter from Oregon, is one of the volunteers who has come here to chase his dream of becoming a pararescueman, or PJ. When called, he steps out of line and trots into what looks like a Hollywood movie green screen set. This is the Dari Motion capture system. It's been in use since 2015, adopted by pro and NCAA sports teams. The prep course here at Lackland became the first in the Air Force to use it, but several training units saw the results and have since bought their own. A combination of new tech and big data is opening a future where human bodies and minds are calibrated like warplanes. "This is just like an aircraft coming down and they hook up the computers to it and they download how well that aircraft performed," says CMSgt Joshua Smith, an instructor with the 350th training squadron. "We're doing the same thing with these warriors we're developing." As Kayden strikes a scarecrow pose, eight high-resolution cameras measure the motion of his major joints, tracking their movement as he goes through a set of calisthenics. A screen mounted on the wall displays his image with an outline of his joints overlaid in bright pink. As he hops, twists and squats, the overlay moves in real time, highlighting the biomechanics of every action. If there's any flaw or imbalance, the monitor will show it. Kayden was a college baseball player and a firefighter, and seems to be in great shape. But Matson notices during a lunge that he turns his left knee inward. It's hard to hide muscle imbalances from Dari. It's a biomechanical flaw that training can and must correct. He says he's looking forward to this pursuit of perfection. "They told us this was going to be sophisticated stuff, but this is pretty amazing," Kayden says. Then his lips press a little tighter and he adds: "I knew my legs need work." Most trainees will be scanned by Dari twice: once at the start of training and once at the end to compare results. If the trainees hope to get through the course, dramatic improvement is required. A trainee's day begins in one of the 50 identical beds lined up in an always-65-degree-F room. The first tasks are to input a seven-question survey on a government-issued tablet. Questions cover quality of sleep, overall physical condition and mental state. Now is also the opportunity to request a visit from a teacher, psychologist or chaplain. "One thing about this generation: If you put a device in front of them they will tell you exactly how they feel," Smith says. Next is the urine test to check hydration. After that, the trainee lies down and an electrode is attached to their forehead and finger for an omega brainwave reading. Heavy exercise can knock down the brain's voltage down to levels that cause confusion, lethargy and lack of concentration. If that's the case, training staff needs to account for it. All this happens before 5am. 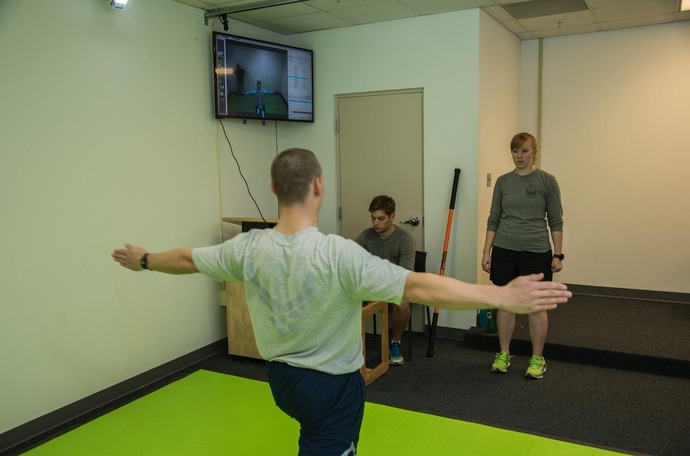 The trainees then head to the "blue room," an all-purpose exercise area for stretching tired muscles and loosening tendons. At around 6am, during breakfast, the training staff meet and go over the charts. They rely on automated programs to spotlight any red flags within the data. With six hours of grueling workouts, runs and swims every day, recovery is nearly as important as the training. It's personalized to every trainee. Some respond to a cold bath, others bounce back in a hot tub. Some recharge using yoga, meditation or by being entombed in sensory deprivation float pod. This is not a personality thing. The response of a person's nervous system dictates how they should recover. During every run and workout, the trainees wear a round Zephyr puck sensor, about the size of a bar of hotel soap, against their chest. They call it getting pucked up. The puck captures 40 different streams of data, constantly recording the stress in a trainee's body to empirically show if they are giving full effort. Staff say they must know where the trainees' physical and mental performance limits are so they can safely push them past them. For efficiency's sake, the military would love empirical tests that can help focus the effort on only the most promising candidates. Similarly, if there is a helpful gene that can identified in a recruit through a blood test, the military would very much like to know about it - and how to activate it with training. For example, the squadron at Lackland this year is collecting blood to measure hormone levels during training and will periodically check changes in the levels during the airman's' career. Still, the human element still rises amid the algorithms, tablets and sensors. The staff see patterns that are harder for an algorithm to quantify, reminders that there is more than just numbers, physics and chemistry at work. For instance, staff have found that trainees who have faced challenges early in their personal lives not only do better, they also tend to assist and elevate teammates who are struggling. "We have data to show that, as you increase in your level of physical performance, there is not necessarily a corresponding increase in your success rate here," says Colonel Parks Hughes. "There's a level of grit, if you will, that's required to get through the preparation that we put individuals through." All the brain wave readings and sensors can detect a recruit's level of effort, but there's no way to quantify a trainee's character and sense of self. These are critical variables, but they're not the kind of things that can be measured with an electrode stuck to someone's forehead.